Debuting the week of the Miami Yacht & Brokerage Show, Bluewater Yacht Sales recently launched an all new mobile optimized experience for their existing web site,bluewateryachtsales.com. Designed from the ground up to make searches of Bluewater’s exclusive boat listings quick, easy and straightforward the mobile site is sure to be a hit with both customers and brokers alike. In addition to browsing or searching Bluewater’s brokerage inventory, visitors are also able to view new models and look-up and contact a sales professional by name or location, as well as learn more about upcoming events and connect on social marketing networks.Visitors using mobile devices to access Bluewater’s web site will automatically be directed to the new mobile site which is optimized for a consistent experience on iOS, Android, Windows, and other major smartphones. The full desktop version of the site will continue to be available to all visitors as well. 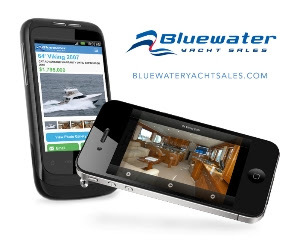 Request more information or experience the new site yourself by visitingbluewateryachtsales.com on a smartphone device.